"Just wanted to give you an update on the Allard (K2-2022) after taking first in class and best in show at the 2012 Annual All British Motor Vehicle show she Went to the Ironstone Concurs d'Ellegance in Murphys (fantastic show) and took first in class European Sports & Grand Touring (my Porsche also won its class see attached photo). 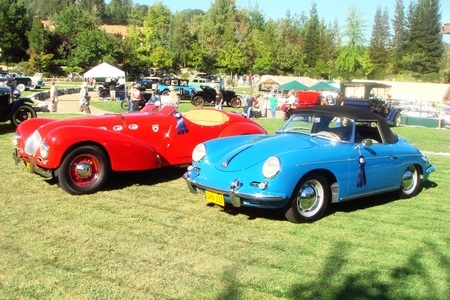 The next show we did for 2012 was the British fall Classic, in Morgan Hill again first in class. So far for 2013 we were asked to return to the 2013 Annual All British Motor Vehicle show where we were not allowed to compete in our class because as we were past winner but they have a Winner Circle Class where you compete against every class winner from last year and the Allard won that. We next did the Hillsborough Concurs d'Ellegance and they stuck us in there race car class (wrong class for us and a frighteningly strong field to include a car from the Mozart Collection) but we took a second. Next up we got the great news that the Allard will be appearing at the Annual, The Quail a Motorsports Gathering Event during Monterey car week. And the last cool thing is that the Ironstone Concurs d'Ellegance requested to use the Allard on there 2013 poster, draft attached. All in all a pretty exciting year for the old Allard!!" Congrats to you David and we look forward to hearing how the Quail and Ironstone shows go for you and 2022. ...click here to drop us a note to tell us what you're up to this summer.